Stay up-to-date with the latest talk of adventures and adventure equipment in Southwest Colorado. The Essence: The Highland Mary and Verde Lakes located are well above 12,000-ft in high alpine. The hike encompasses an expansion of wildflowers and five crystal clear lakes, all of which offer beauty beyond compare. Individuals can hike 3 miles to the Highland Mary Lakes or a full 6 mile adventure past the Highland Mary Lakes to the Verde Lakes and back. Getting there: From 32nd Street in Durango drive 46 miles north along the Million Dollar Highway (U.S. 550) to Silverton. Drive straight through the town of Silverton and make a right turn onto San Juan County Road 2. After 2 miles, the road will split, you will head straight. After driving another 4 miles turn right onto County Road 4 here you will see a sign directing you to Mine Tour and Stoney Pass. Here bear right for 1.7 miles and do not take the road to Stoney Pass. At another split in the road bear right for another 3.7 miles and cross Cunningham Gulch. Follow this road and turn left on a road leading to a stream crossing. If you do not want to cross the stream in your car there are a few spaces for vehicles to park before the crossing. The Route: The trail begins to ascend southerly 0.2 miles from the parking lot. Stay straight where a marked stock sign trail splits left and cross a creek. After 0.8 miles into the hike you will see an entry sign into the Weminuche Wilderness. Follow this trail for a little over a mile until you hit a rock face. Scoot around the face on the right side and cross the small creek. Soon you will see a sign marked Highland Marys Trail. Stay along this trail (to the right of the stream) and work your way up the slope. Soon you will reach the first (smallest) of the three High Land Mary Lakes. From here there are trails circling the lower lakes and spectacular views of vistas from every direction. If you wish to experience more, the two Verde Lakes are just another mile south. As you get closer to the Verde Lakes you will see a sign marked Continental Divide. This route closely follows the Divide which will lead you back to a marked trail junction that connects back to the Highland Lakes. 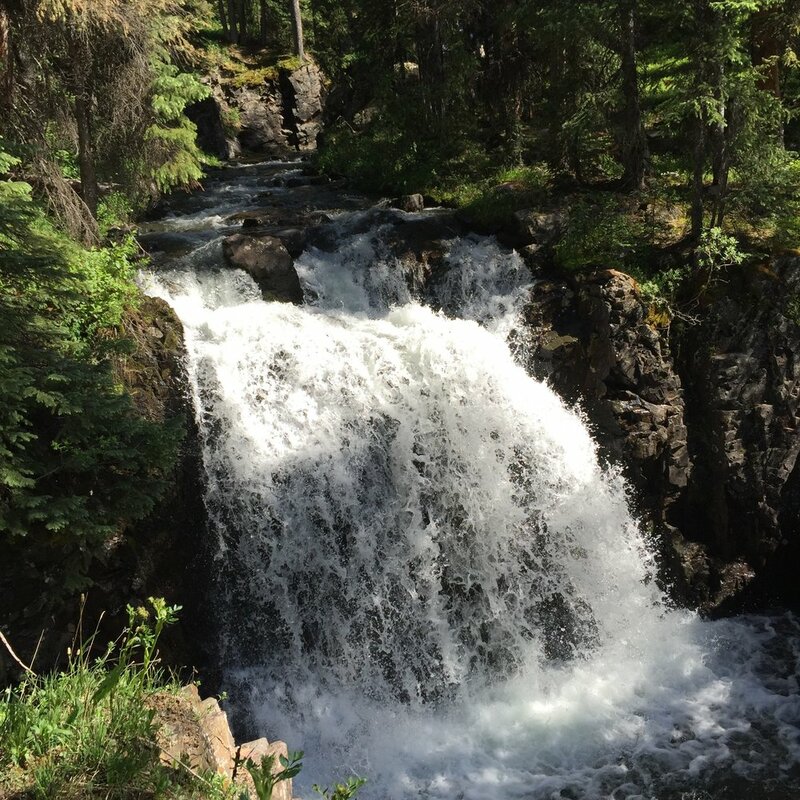 Comments: This hike is considered difficult from the very steep climbs, water crossings (depending on the time of year), and the rolling tundra to the Verde Lakes. Late July through August is ideal for wildflower viewing but be mindful summer thunderstorms occur often and this hike is well above treeline, so plan accordingly! Also a 4x4 cars are required on these road crossings. I’ve been selling Benchmade knives for little over a year now. I am completely sold on the brand and in my mind they are the best quality production knife on the shelves today. The lifetime warranty is the best in the business. For guys like me that aren’t the best at sharpening knives they have a life sharp program where you send in your knife and they put the factory edge right back on. My only complaint about this service is it takes about 4-5 weeks to get your knife back. I wanted something manual because the axis lock is something I couldn’t live without. I wanted something that had either S30V or S90V. I like serration and the blue class just had some great looking knives. So finally I narrowed it down to three choices Mini Grip, Valet and the 940. After thinking about it for a while I deiced the 940 was coming home with me a slow Monday night in January. There were two different kinds of 940s the 940 with a aluminum handle and S30V steel or the king of the 940s the 943 with a Carbon Fiber handle and S90V steel. I was going to treat myself and walk away with the best knife in the case the 943. I’ve carried this knife with me every day for almost a year now and I love this thing. It’s got the functionality I want and had its own style that sets it self aside from all the other knives Benchmade makes. Here are some pros and cons I have about my knife. - Fits in the pocket well. - Dulled the factory tip pretty quick. Known as one of the most beautiful passes, Red Mountain Pass offers direct passage to some of the most pristine camping and hiking adventures. As part of the "Million Dollar Highway" the strecth is located in between Silverton and Ouray, Highway 550 reaches a height of 11,018ft just below Red Mountain itself. Red Mountain Pass stands at one of the highest paved roads in the United States. As the road twists and turns between majestic scenery in the Uncompahgre National Forest there are many spots to pull off and stop or camp to appreciate the surroundings. Along the highway there are continuous county roads that service trail heads to the surrounding mountain tops that include Anvil Mountain, Lookout Peak, Ohio Peak, McMillan Peak and of course Red Mountain. The Essence: Engineer Mountian is arguably the number one go to spots in the San Juan National Forest. The bald 13,000-foot giant towers over the ever so small feeling highway 550 below. Engineer Mountian offers many activities during both summer and winter. Everything from day hikes to all day mountain bike rides in the summer. Or in the winter a snowshoe or backcountry skiers playground. Getting There: From Durango drive north 34 miles on U.S. 550 passing Purgatory Resort till reaching the summit of Cole Bank. Just after the summit, there will be a dirt parking lot on your left where the trailhead is marked and awaits. The Route: From the dirt parking lot there is a give or take a 45-minute hike will lead you to the base of Engineer Mountian. At the fork From there, many options are available, including summiting Engineer Mountian or taking EMT trail due south or Engineer creek trail towards the North. Comments: We highly recommend taking a trail map as well as all the proper gear along with you. As for us, locals know the weather in the south-west high country can change in the blink of an eye. Please be aware that there a few pitches near the summit of Engineer that are near vertical. Please don't hesitate to stop in if you have any further questions. It’s that time of year again, our team at Gardenswartz are preparing for the biggest sales event of the year! 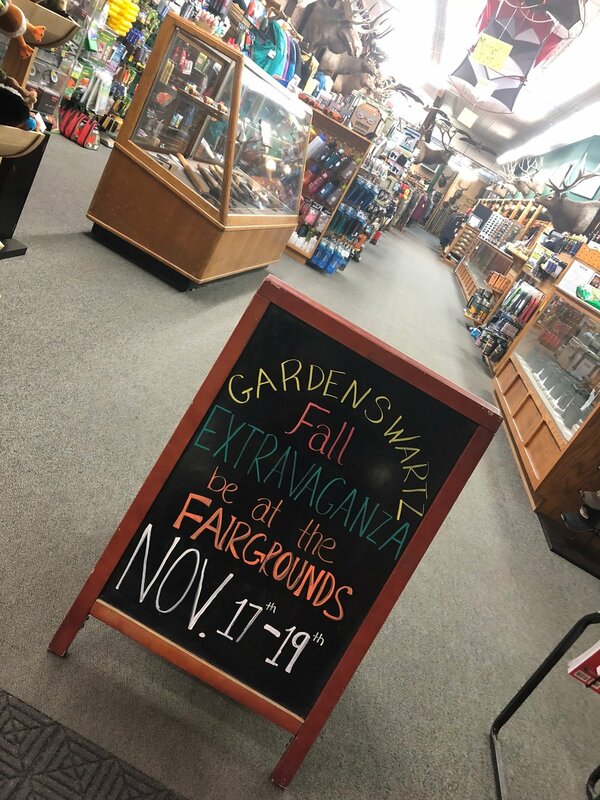 That’s right, we will be hosting our 18th annual fall Extravaganza at the La Plata County Fair Grounds on November 17th-19th, doors open at 9 am! We will have over $100,000 worth of Merchandise on sale, as well as even more products provided by Ski Barn. So come on down and get some Christmas shopping done earl this year! The Essence: Just 18 miles Northeast of Durango in the San Juan National Forest and adjacent to the Weminuche Wilderness is the beautifully tucked away, Vallecito Lake. 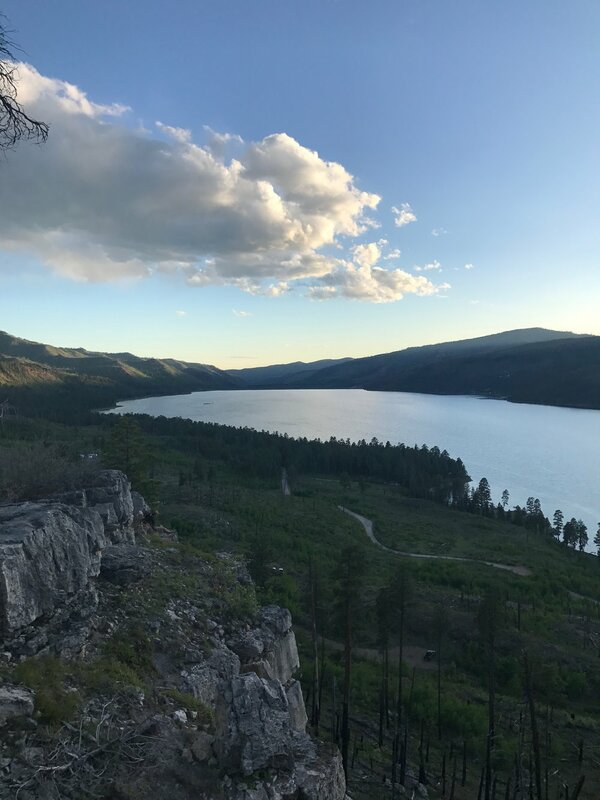 Vallecito Lake offers ample recreational activities year-round from camping, hiking, snowshoeing, horseback riding, boating, fishing, hunting, dog-sledding, and much more! The name Vallecito means "Little Valley" and is considered one of the largest and most beautiful bodies of water at an elevation of 8,000 ft above sea level in Colorado. With all that in mind, there are many camping opportunities at Lake Vallecito. To begin, there are 3 full-service RV and Cabin Resorts for the 'glampers' (glamor campers) of the world and 7 seasonally-maintained campgrounds. Getting There: From main avenue head north to 15th street and make a right, this will lead into Florida Road and go straight through the round-a-bout. Go straight on Florida Road for 13 miles then make a right onto County Road 240. From here, travel about 3 miles till you make a left onto County Road 501 stay on this road for 4.5 miles then turn right onto County Road 501A. At this point in time, you should be making a right by a small convenient store (don't expect much if you forgot something). Along this road you will come up behind the lake and see there are many campsites along the path! Comments: In total it should take about 45 minutes to an hour to get to a campsite. It is a good idea to bring an all wheel drive vehicle for some of the rougher terrain (depending on the time of year) but I have effortlessly romped around in my Volkswagon Jetta several times. Other things to be mindful of when driving are the free range cattle roaming this area. 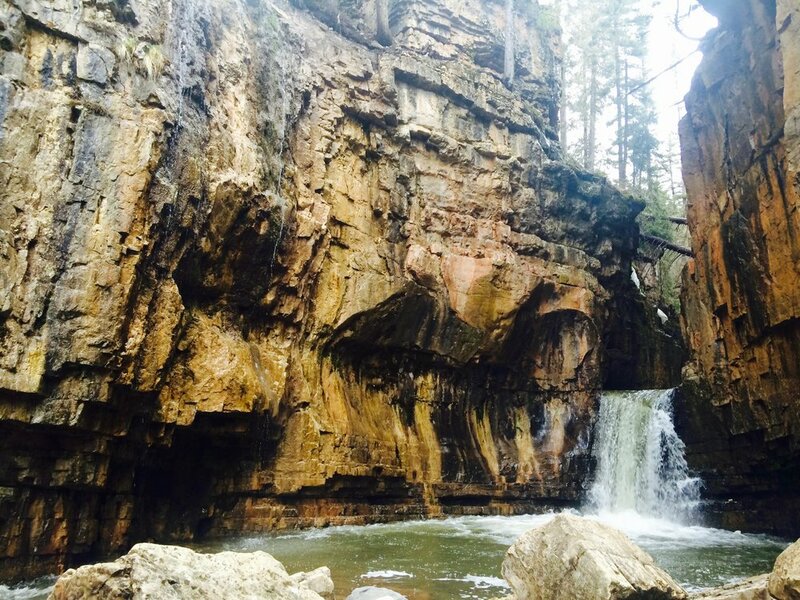 The Essence: Tucked deep in the canyons of the San Juan National Forest is a beautifully hidden 15 foot waterfall at the end of the Cascade Creek Trail. This hike down can be done year-round depending on hiking expertise. In the summertime, an array of beautiful native wildflowers surrounds you as you descend down into the roaring canyon. Or in the winter, snowshoe down into the blissful, (sometimes) untracked path along the slow trickling stream. Also in the winter, you're likely to encounter ice climbers and caves but, be mindful the path can not only be slick but hidden at times! Getting There: From Durango drive north 28 miles on U.S. 550 until you pass Purgatory Resort and Cascade Village. After passing Cascade Village, you will make an immediate hairpin turn over Cascade Creek at which, you will make a right turn into a dirt parking lot. Park here and begin to walk east along the dirt road, past the emergency cabin, and red-colored cattle guard. The Route: On your right after the cattle guard and before the large road access informational sign, a trail head should begin traversing you down into the canyon. After a half a mile hike down, make your first left by some trees and begin hiking along the side of the canyon path. If you look up and closely you will find metal spikes (pitons) nailed into the rock which help climbers traverse safely across the surface. Follow the sound of the roaring waters along the path for a little over a mile until you reach the destination. Comments: This is considered an easy hike in the summertime but can be considered moderately difficult in the winter, due to the slick and uncertain trail conditions. In the winter, the parking lot is icy and not plowed so it is recommended to have a car with all wheel drive.